Little League Baseball program located in Danvers MA. The Parade is this Saturday, April 27th at 10 AM. We will start lining up between 9:30 and 9:45 AM no earlier please. This year all leagues will line up along N Putnam St. with Danvers National Little League lining up starting at the intersection of N Putnam St. and Bell St. down to the 88 Restaurant (see map below). Coaches please line your teams up in alphabetical order by division starting with Challenger, Tee Ball, Farm, A, AA, AAA and Majors. We will have a couple league representatives there to help out. While lining up please be respectful of the homes along N Putnam St. This year we ask that each team have at least 3 adults walking in the parade with the kids. Parents if you plan to walk please help keep the kids from crossing the double yellow line in the road. The Danvers police will be working hard to block the roads from cars, but every year, one or two get through. Please help keep the kids safe. Parking at the park will be tight as we close off the lot at Tapley Park in the morning due to safety concerns. The only exception is for handicap parking. We encourage car pooling and there should be plenty of parking at Rebecca Nurse and across the street. Please do not block access to any of the local businesses and avoid parking in the lot across the street from Chet's Lock Shop they complained last year and parents had to move their cars. We have created a map this year, showing the parade route, with parking areas marked in blue and no parking in red. Click here to view the map. We could use some help Saturday morning getting the park ready for everyone. We will be down there starting at 7:30 AM. If you have some time please join us there is always plenty to do. Spring is in there air and it is time to break out the gloves and dust off the cleats. 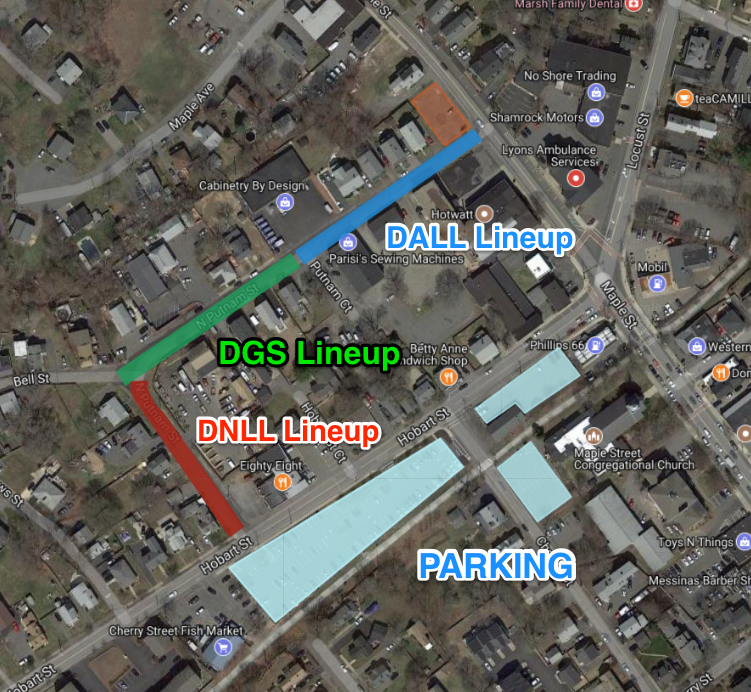 We are just a few weeks away from all our Little Leaguers making their way through downtown to Tapley Field where we open the DNLL 2019 Season with some fun in the sun. Baseball is truly an American past time and a wonderful way for our boys & girls to meet new kids and make lasting friendships. If you are new to town, it is also a great way for parents to get together and meet new people, while soaking up the sun, enjoying a Tapley Triple and watching the inevitiable Tee Ball pig pile as all the infielders race play the ground ball. Our season typically runs 9-10 weeks from the last week in April to the last week in June. All players get a team jersey and hat. or our President Joe DeBernardo at . Click here for the boundary map of DNLL and DALL. Thank you to the many volunteers that help operate Danvers National Little League. As a reminder, all Board Members, Managers, Coaches and other volunteers must fill out a Little League Volunteer Application for 2019 and submit it along with a copy of your driver license to DNLL Safety Officer Jared Waterman via email at . Be sure to include SSN's and Dates of Birth on all Applications, Thank You. Parking at Tapley Park can be extremely tight during the baseball season, particularly on weekends. Please park your vehicle in a designated parking spot at Tapley. If all designated parking spots are utilized, please park your vehicle in the satellite parking lot abutting the bike path across Pine Street. Please use the crosswalk to access Tapley Park. Please note that parking at 142 Pine Street (Scrubbles Laundromat and Petes-A-Place Restaurant) is prohibited, and may result in your vehicle being towed. Parking for games or practices at Highlands School can also be tight. Please park your vehicle in a designated parking spot at the School, or a designated area along Hobart Street. Parking at First Church of Danvers at 41 Centre Street is prohibited, and may result in your vehicle being towed. If you or your business would like to sponsor Danvers National Little League, please contact . Please click here for a sponsor form which includes all the DNLL sponsor details. A concussion is a type of traumatic brain injury, or TBI, cause by a bump, blow, or jolt to the head that can change the way your brain normally works. Concussions can also occur from a fall or blow to the body that casuses the head and brain to move quickly back and forth. Health care professionals may describe a concussion as "mild" brain injury because concussions are usually not life threatening. Even so, their effects can be serious. Click here for information pertaining to Concussion in Sports presented by Centers for Disease Control and Prevention. Please click here to read more about the composite bat moratorium including frequently asked questions. Please click here to see a list of Composite Bats &ndash; (2 &frac14; inch barrels) approved by Little League International.